What is dementia? It?s not a disease itself, but is rather a term used to describe memory loss and problems with thinking that are severe enough to have an impact on your day-to-day life. 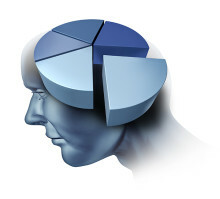 Dementia encompasses several different conditions. The most common form, which affects up to 80 percent of people with dementia, is Alzheimer?s disease. In Alzheimer?s, abnormal proteins called beta-amyloid and tau build up in the brain and destroy nerve cells, leading to memory loss, loss of judgment, and other symptoms of the condition. Vascular dementia stems from blocked or bleeding blood vessels in the brain, which can be due to a stroke. A lack of blood flow eventually damages brain cells. What is dementia with Lewy bodies? It begins when a protein called alpha-synuclein clumps together in the brain and causes damage. When the different forms of dementia occur together, they are called mixed dementia. No single test can determine with any certainty whether someone has dementia. Diagnosis involves several different examinations and tests, including a health history, physical exam, neurological tests, brain imaging, blood tests, and tests of mental status. While there currently is no cure for Alzheimer?s or other forms of dementia, treatments can address symptoms and help people live better with the disease. Some drugs target the irritability and moodiness that can accompany dementia. Other medicines improve sleep, which becomes more difficult as dementia progresses. Two types of drugs?cholinesterase inhibitors (Aricept, Exelon, Razadyne) and memantine (Namenda)?can slow memory loss from Alzheimer?s disease, although they can?t halt it entirely. Researchers are currently trying to develop drugs that will prevent the damaging proteins that cause dementia from forming, or clear up proteins that have already formed. These and other therapies offer hope for a more effective dementia treatment, or one day, a cure. It’s important to be familiar with the signs of dementia in men; early diagnosis allows for initiation of treatment and planning for the future. Studies show that one of the greatest health fears among older Americans is the fear of losing their minds to dementia in their later years. Yet despite the dread associated with the term, many people have difficulty answering the question, what is dementia?